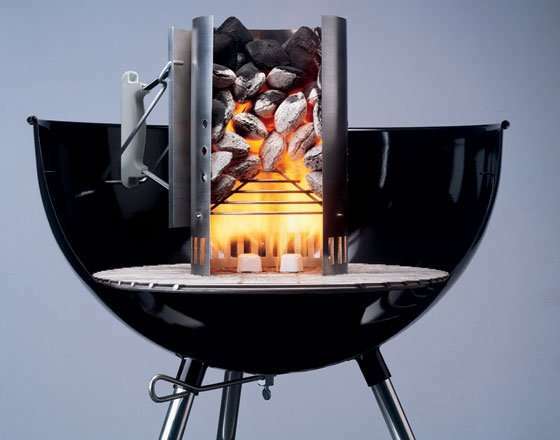 There are many reasons to find out how to start a charcoal grill without lighter fluid. For me personally the reason is that I prefer not to use lighter fluid because I think adding a chemical to my cooking is not a good idea. There are many people who don’t agree with me and say that all the chemicals are burned off before you start your actual cooking, but to me it seems that I keep smelling it all the time. The method I have been using for many years is using a chimney starter and it works like a charm. I have had several of them. From cheap to higher priced, but the one I prefer is the Weber chimney charcoal starter. The basics of any chimney starter is the same. It is in the shape of a can and a few inches from the bottom is a grate. On that grate you put the charcoal briquettes and underneath the grate you put a heat source. I use a crumbled up newspaper, some people use the lighter cubes. I prefer newspaper because they are free and I don’t like to use chemicals for my cooking. Some people look for a way to start lump charcoal but I do this the same way. A picture can maybe explain it all better. On this picture you can see how the chimney charcoal starter works. The so called chimney effect makes the air go from underneath the grate to the top and in that way adds oxygen to the fire. Once all the coals are burning you poor the red hot coals on you grill and after a few minutes, when they turned grey, you can start grilling your meat. 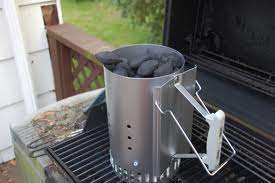 My recommendation is the Weber chimney starter. Like I mentioned I have mine for many years and although it is a little higher in price I have had cheaper once that did not last long. You get what you pay for in most cases. Click here to check the price on amazon for the recommended charcoal starters. There are 3 sizes and depending on your size grill and charcoal need you can pick the right one for you. But sometimes a video explains it all better then I can. I found a video of a first time user of the Weber charcoal starter for you. If you can not use a chimney starter you can have a look at our Electric charcoal starter reviews to see if this will be better for your situation. I also describe there how to use an electric charcoal starter. In some apartment building it is not allowed to use a chimney starter and this is a good alternative. If you have an other method feel free to share it with us.